How to serve a millet pie. Wash the millet with water with a colander under running water. Bring salted water to a boil, throw millet and cover. Cook over medium heat for 25 minutes. Cut the onion in small cubes. In a skillet, fry the onion over medium heat with a pinch of salt and a bay leaf. Wash and peel the carrots and courgettes. Cut them in small cubes. Add the carrots and zucchini to the pan, poached with onion, mix the ingredients, cover and cook over very low heat for 5 minutes. Strain the sauce, add millet to the fried vegetables. Remove bay leaf, add 1 tablespoon of turmeric and mix all ingredients. Place in a round glass baking dish. Bake at 170 for 15 minutes. Serve as a main dish. 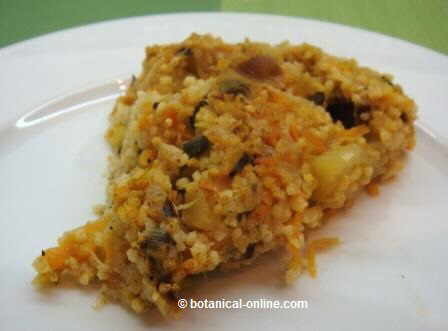 This millet pie is a very original healthy recipe to vary the presentation of our dishes and our diet. Because of its high carbohydrate and fiber content, this dish brings energy and provides satiety preventing us us want to snack between meals. If you add turmeric to this preparation, in addition to color, you will benefit from curcuminoids that improve digestion, preventing stomach and liver pain. Millet is a gluten-free cereal, so this recipe is a good choice suitable for coeliacs. More information on millet recipes and properties.